A macron is a bar that goes over a letter, used in many languages, or as symbols in English, e.g. The character above is the unicode &H0101 character, "latin small letter a with macron". With Word 2004, you can input a unicode character by (a) using the Extended US Keyboard, typing Option-a then the letter of your choice, (b) using another keyboard layout that includes macrons, or (c) selecting the character in the Character Palette and clicking Insert. MacWord versions prior to Word 2004 don't support unicode fonts. One frequently asked question on the newsgroups is how to create a macron in a non-unicode environment. Central European (CE) fonts have characters (vowels) with macrons. Note that the CE font (or a close substitute) will need to be installed in all machines on which the document will be viewed or printed from. Type your letter (say "a") then Shift-Option-Comma. You'll see the macron after the a. 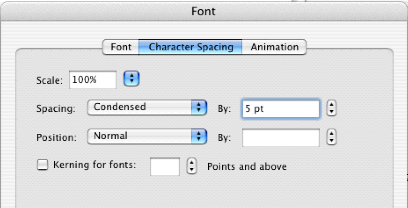 Select the a and choose Format/Font/Character Spacing. Set spacing to "condensed" by 5 or 6 points or so. Use the arrow keys to select the macron (make sure you select only the macron - it may be difficult now that it's been moved), and set its spacing to "expanded" by 2 points or so. Depending on the font, you may have to tweak these slightly. Now, whenever you type "amac" followed by a space or punctuation mark (assuming you have Autocorrect set to Replace text as you type), an a with a macron will be inserted. You can use the same technique for the other letters. This page last updated on Friday, 25 June 2004.